Who is responsible for welfare of LNR and DNR? The humanitarian situation in the so-called Luhansk and Donetsk People's Republics [LNR and DNR] controlled by Kremlin-backed separatists and Russian military personnel, is quickly becoming dire. Long-term self-sustainability within current boundaries, according to this excellent Hromaske.tv report, is 'near-impossible'. I wrote previously President Poroshenko has passed a decree to withdraw state support to inhabitants of these regions - this has caused some significant controversy. The long-time mayor of Donetsk, Oleksandr Lukyanchenko gave an long television interview last week that perhaps deserved more attention than it received. Having been forced to flee from Donetsk for refusing to co-operate with the separatists, he is now believed to be in Kyiv. He makes it clear that the armed conflict in Donbas should be called a war, not an anti-terrorist operation. "Yes, the Russians crossed the border, and we should call things by their proper name. The Russians are now delivering hundreds of pieces of weaponry, but we still continue to say that an anti-terrorist operation is ongoing. Why don't we call things by their [proper] name?" He openly stated that people in the area, in his city, never wanted, and do not want to detach from Ukraine. He suggested that if more resistance had been offered by Ukrainian forces initially during the Crimea take-over, then a similar situation may not have arose in Donbas. He claims 'its not our war, and Donbas is merely a bargaining chip between major powers'. He calls it immoral that Kyiv has financially cut off the occupied territories in the East and suggest cash could be transferred to individuals bank accounts electronically, so that people could still purchase provisions with debit cards in the still reasonably well stocked major food outlets. He claims that Donbas citizens are fully entitled to pensions, having contributed to state schemes for years. He claims up to 50% of industrial capability is now destroyed and many of the brightest and best amongst the population have left. It is difficult not to have some sympathy with those that are left in Donbas, but I think that despite bold pronouncements by president Poroshenko and others that Ukraine must remain a unitary state within the pre-2014 boundaries, there is a growing feeling of 'shadenfreude' amongst some Ukrainians who consider it may be better to ditch the troublesome Donbas for good. In one article article author Vasyl Rybnikov describes how six months ago many ran through squares in Donbas and Luhansk oblasts and plundered supermarkets, waving flags supplied, allegedly by Rinat Akhmetov's warehouses, in joyful anticipation of the incoming of Putin, who would be welcomed on bended knee. Somewhere along the way it all went horribly wrong. Humanitarian aid from Putin has been stolen by those supposedly defending the people from the 'genocidal nazi junta'; and the future looks grim indeed. Donbas which was [erroneously] considered by locals to be carrying the whole of the Ukrainian economy on its back is now not even capable of feeding itself. And how is it that the great Donbas patriot, king of Donbas, Rinat Akhmetov is now residing comfortably in the heart of the fascist Banderite junta state - the blood-riven capital of Ukraine - Kyiv - and not in his own home town? The recently-appointed governor of the part of Luhansk oblast under Kyiv control, Hennadiy Moskal, in an interview in Dzerkalo Tyzhnya, puts the blame for the dire situation in the East of Ukraine squarely on the Party of Regions' leadership. "I blame the 'Regionaly' for setting fire to Donbas, for developing the war, and then running from the field of battle like rats from a ship. I blame them totally for all that is going on in Donbas and Luhansk in general. It's their slogans, used by LNR and DNR - Fascists, Nazis, Punishers. They provoked everything, wound up the people, and when they lost control over them they fled, leaving everyone to their fate. Ours is the only oblast in Ukraine where the regional council is not working (it is almost 100 percent Party of Regions). All have fled." The DNR leadership have promised some social payments will be made to the needy on December 1, but no-one is holding their breath on this. Ukrainian patriotism is honest and decent...and multilingual.. Well-known Russian novelist, Boris Akunin, [who is of Georgian origin] recently attended a big concert at one of London's top venues staged by the legendary Ukrainian pop group Okean Elzy . Okean Elzy, who have been popular across the CIS for many years, were at the forefront of last winter's Euromaidan demonstrations in Kyiv. Their concerts have been fantastically well received all over Ukraine since then. Akunin says he was very jealous of the audience of Ukrainians in London, most of them according to Akunin, Russian-speaking, They lustily and emotionally sang Ukraine's nation anthem together with the band. This was honest, unashamed patriotism - pride and joy of being a Ukrainian citizen, and even more so, taking place in London, and not in Kyiv. Akunin concludes he finally now 'gets it' - what being a Ukrainian really is about. Putin and Yanukovych have unwittingly created great unstoppable national revival across that country. In the Russian Federation, the many differing lesser ethnic minorities experience discomfort, maybe a frisson of fear when they hear the singing of the Russian national anthem. According to Akunin shouts of 'Glory to Russia!' would only be heard "at a bureaucratic[ally organised]-patriotic events, or at meetings of aggressive xenophobia." Russophone Ukrainians shout 'Slava Ukraini' just as sincerely as their Ukrainophone friends..they are proud of being Ukrainian. Akunin feels bitter that Russians are not the same as these liberated Ukrainians. And some former opposition activists, like Tatyana Chornovol say the occupied part of Donbas "should now be separated from the Ukraine." This is the winning option for the state". I think there will be more and more similar comments made in weeks to come..
President Petro Poroshenko has compared the Holodomor of 1932-33 with the current war in eastern Ukraine, declaring the war is a continuation of imperial genocide against the Ukrainian people. Hunger? Now in and around Donbas? I can't get my head around this.. The thugs that are in charge of DNR and LNR are are not concerned about the welfare of those incapable of looking after themselves in areas they control..For them humanitarian aid is another get rich quick opportunity. Should Kyiv provide for the welfare of citizens in LNR and DNR? President Poroshenko's decree withdrawing state services and aid to separatist-controlled territories at a time of extreme hardship for residents living there has caused much discussion. Many consider it to be a callous and inhumane act particularly in a country over which the spectre of Holodomor still hangs heavy. But as journalist Vitaliy Portnikov explains, the Kyiv government should make it clear to everyone: separatist-controlled parts of Donbas are de-facto territories occupied by Russian forces and their proxies. As such, the occupiers are absolutely responsible for the administration all aspects of life there. Putin claimed yesterday, by way of comparison, that Russia continued to pay welfare payments in Chechnya even during the wars that took place in that region. Such comparison is false - Chechnya was not invaded by any foreign power so responsibility for order, and welfare, remained with the Russian Federation. As for the true situation on the ground in occupied Donbas, it seems that in larger inhabited centres some relief is being provided particularly by charitable organisations and especially by Rinat Akhmetov's personal relief fund. In Donetsk itself, life is, according to some accounts, becoming more bearable that in August/September. Those that can travel from occupied territories to Ukraine-proper can register there for receipt of social assistance, but for the immobile and infirm this is impossible. Deputy head of president Poroshenko's Administration, Valeriy Chaliy, has stated that Ukraine is willing to provide any humanitarian aid required to these regions, but this cannot be in the form of cash. There is evidence that such money has been 'skimmed off' by separatists into Russian bank accounts. The worsening situation and Poroshenko's decree has prompted savers to hit bank ATM machines hard in Donetsk as savers withdraw cash from their accounts just as fast as they can. One queue comprised 350 persons.. Some consider this is a gamble and will cause residents of separatist-controlled regions to hate the Kyiv authorities even more. But as humanitarian conditions deteriorate further these residents have no-one else to turn to but to the DNR and LNR thugs who control every aspect of their lives. They will be the ones who will inevitably feel that ire of desperate residents, and there are signs this is already happening. November 17 - During the first half of the day citizens began spontaneously organized a meeting in Sverdlovsk. They were dissatisfied with the actions of representatives of terrorist LNR. According to inhabitants of the city, about 500 people gathered outside the building of the local executive committee, where one of the LNR ruling headquarters is located.. There were questions about salaries (state employees have not received money for an extended period), social benefits, and ration cards promised by the head of the "republic". The participants of the meeting, having been driven to despair, were not afraid to openly show their dissatisfaction in city's adjacent House of Culture (also occupied by militants). The gates of the military recruiting office, where militants are billeted had blue and yellow paint poured on them. The militants are trying to quell the unrest; witnesses reported hearing gunfire. But, despite the presence of armed militants more people arrived in the square in front of the executive committee building. By 13:30, there were more than a thousand. How Luhansk and Donetsk oblast residents react to their dire circumstances in the weeks and months to come will be a significant factor in this Russo-Ukrainian hybrid war. There are reports of great problems for the authorities on 'the other side of the lines' too..
And Putin always has the option of invading under the pretext of alleviating a humanitarian disaster that DNR and LNR will have been, to a large degree, responsible for. Independent journalists confirm large quantities of heavy military hardware have entered, and have been brazenly moving around separatist controlled areas of Eastern Ukraine. This new-stock equipment is undoubtedly Russian in origin. As Kyiv newspaper 'Delovaya Stolitsa' explains, the new round of escalation in the Donbas region is merely an attempt to repeat of the events of last August when Russia also hugely ramped up military presence to force Kyiv to negotiate with militant separatists. As a result, after Ukrainian forces' heavy losses in Ilovaisk, the loss of Novoazovsk, and the shelling of Mariupol, on September 5 a ceasefire agreement was signed in Minsk. But neither the separatists nor Russia had any intention to adhere to their side of the deal, and have not done so. The current escalation is similar to these events at the end of August and beginning of September, the difference being the separatist signatories of the Minsk agreement, Zaharchenko and Plotnitsky, had no formal status at that time. Today Russia is forcing Kyiv to negotiate with leaders supposedly "elected by the voters of Novorossiya". In September this ruse worked, so why not repeat the same stunt and so achieve the legalisation of "DNR" and "LNR"? The Ukrainian side has not recognised the pseudo-elections held recently in the occupied enclaves, and neither has any one else of significance, but if former president Kuchma or any other authorised person sits at the table with so-called "DNR and LNR negotiators" this would would legalise their status. The Kremlin needs to show Russians, and the rest of outside world, that Kyiv ostensibly agrees the conflict in eastern Ukraine is of a purely domestic nature; and that after the armed conflict one side is negotiating with the other on equal terms. One DNR leader claims such a Minsk-2 meeting could take place in a couple of weeks, but there has not been any hint of any such meeting being arranged by the Ukrainian side. 'Delovaya Stolitsa' suggests that if president Poroshenko and the Ukrainian MFA is indeed conducting such secret deals on a possible Minsk-2, many Ukrainians will be shocked by such a back-down. Minsk-1 was seen by many as a humiliation and was, perhaps, the main reason Poroshenko's Bloc fared worse than expected in the parliamentary elections three weeks ago. A freshly-elected parliament is due to start work at the start of December; any cave-in by Poroshenko will result in major ructions in the new Verkhovna Rada. Similarly, any more military pressure from the separatist/Russian side will also reduce the likelihood of any Minsk 2 meeting. LEvko thinks Putin is deliberately and arrogantly sending unmarked heavy military equipment into eastern Ukraine in order to humiliate Ukraine and the Western community who desperately want a peaceful resolution to the conflict. Such moves merely generate even more distrust and anger because all know it was Putin who triggered this completely avoidable and tragic conflict, and it is Putin who continues to fan its flames. ps Also well worth reading: "Putin Wants Total Victory In Eastern Ukraine — Not A 'Frozen Conflict". Any Minsk 2 would be a sham, just like Minsk 1. The Kremlin may be settling in for a very long geopolitical struggle with the West, with plans to apply maximum pressure not just on Kiev but on the West, including military pressure (short of war, in the coming months and years. The goal would be to use support of the separatists in eastern Ukraine, and military and political brinksmanship elsewhere, to divide the West politically, weaken the EU, and weaken NATO. The West have no choice but prepare for such a probable scenario. These figures will give Putin much to ponder..
-- As has already been widely reported, today's vote in Ukraine's separatist republics will not be recognized by the West. From the point of view of the leaders of the self-proclaimed "DNR" and "LNR" however, this may be irrelevant, because Moscow has given every indication that it will recognize them. In theory, this will allow Moscow to more publicly deal with the separatists as a government separate from Ukraine. -- Drawing official turnout figures will be nearly impossible. Nonetheless, reports on the ground showed long lines of people and in interviews, many were less enchanted with separatist leaders than bitterly angry with Ukraine's leadership in Kyiv. The war in eastern Ukraine has taken a heavy toll and it is clear that many in Donetsk and Luhansk blame Ukraine. -- In the weeks leading up to this vote, many had talked about it signaling the start of a long-running frozen conflict, with de-facto borders. However, reports that Russian military personnel and equipment are again entering Ukraine in large numbers may mean something altogether different. Separatist leaders have said they plan to reclaim lost territories and also the important port city of Mariupol. And its not just about land -- areas currently in Ukrainian control have resources that may be necessary to maintain viable services, including electricity. -- Russia appears to be testing the West again. The vote today was a clear violation of the Minsk agreement, signed by Russia, which stipulated that early elections in separatist-controlled areas of Donetsk and Luhansk would have to take place under Ukrainian law. Does the EU -- now distracted by other international events -- have the wherewithal to continue, and add to, the sanctions already in place against Russia? What is the EU prepared to do if Russia escalates the conflict militarily?" p.s. Unless there is a very firm and concerted response from EU leaders who have been ignored yet again, and military assistance is provided from abroad, Mariupol will be under serious threat of attack. It appears from video clips/photos that few Donbas citizens in the 18 - 30 year age band voted? At hustings it was predominantly the middle-aged and elderly who were in attendance. Proper revolutions are youth-driven...no? My guess is a huge number of young people, especially those with marketable skills, have now left Donbas, probably for ever. Old men will not rebuild much..and the young win out in the end. My father used to tell me in Soviet times, on polling days extra food was frequently distributed, [and expected too] Normally scarce white bread would surprisingly appear! What a treat! 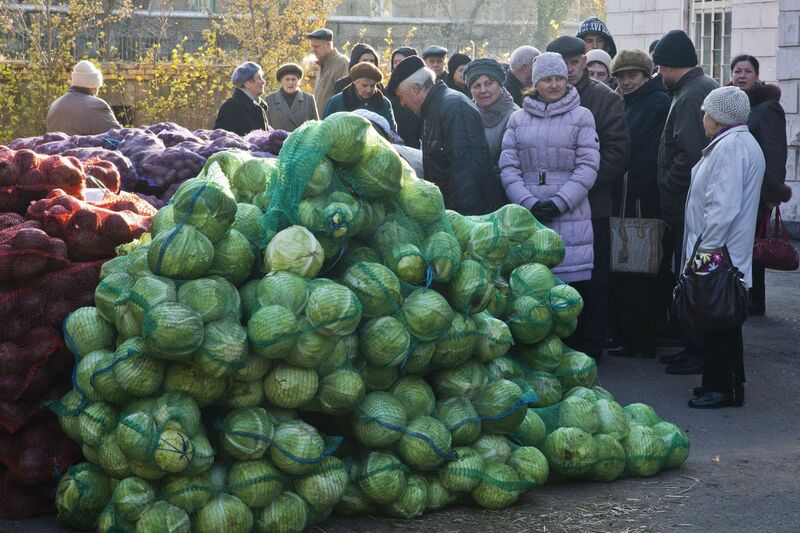 crowd of voters gathers outside a polling station near a pile of vegetables that can be bought for less than 10 cents after they cast their ballots on Sunday.